How do you like your BBQ??? The homies at SLAB BBQ & Beer keep it real… Slow, Low And Bangin’! This truly might be the most underrated BBQ joint we’ve been to in Austin. Show them some love and tag 3 friends! Nick and Johnross are 2 dudes who love food. Join them as they adventure through diners, food trucks, restaurants, coffee shops to breweries and much more. Most importantly, let them know your favorite spot as they would love to visit and showcase more nomsss! SLAB was founded on the basis of bringing you new flavors that are a break from your traditional Texas BBQ. We bridge the taste bud gap of the Dirty South from Memphis, to the Carolinas, Alabama, and Texas. Along with our delicious smoked meats, SLAB offers four different award-winning BBQ sauces. With so many barbecue joints in Austin, Slab needed to do something different to stand out. When creating the menu, the team decided to focus on sandwiches, instead of the typical meat-by-the-pound platters. Slab also wanted customers to be exposed to other styles of barbecue, not just Texas-style. 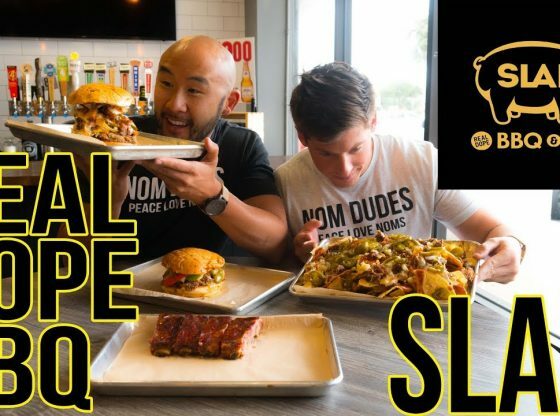 Find out what's popular at Slab Real Dope BBQ in real-time and see activity, reviews and ratings! Join us Friday Feb 22nd, 7-9p for the airing of Diners, Drive-ins & Dives featuring the dopest BBQ joint on the planet, SLAB BBQ & BEER. Seating is limited, but we'll have some extra seats and TV's on the patio at both locations in North Austin and Oak Hill.